I’m going to kick off the Linux Toolbox with a relatively simple one. Benefit: save time and effort by simplifying complicated, commonly-executed commands. If you spend any time at the Linux command-line, chances are that you are going to type the same commands repeatedly. Or, there may be long or complex commands that you enter only rarely, but you don’t want to have to look up every time you need them. 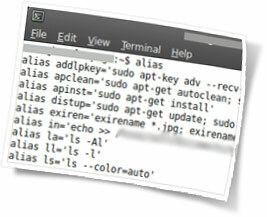 Alias allows you create temporary command shortcuts within the current terminal session. This example would create the shortcut ll, which would execute the command ls -l and give you a listing of your current directory in the “long” format. simple stuff. And, since it’s temporary, once you initiate a new terminal session, typing ll will probably result in a command-not-found error. This follows the bash syntax of separating multiple commands with a semi-colon, and gives you a single command to execute what would normally require much more typing. This particular alias is probably the command i use more than any other, as I tend to run the upgrade pretty much daily. Alias is great by itself, but its usefulness really becomes apparent when combined with the .bashrc file, which handles the task of setting up your bash environment each time a session is initiated. In fact, if you look at your current ~/.bashrc file, you’ll probably find several aliases already setup. you can type alias as a command with no arguments, and it will return a list of all the aliases in your current session, including those established in the ~/.bashrc. Then create the ~/.bash_aliases file, add your new aliases (one per line), and copy over any existing aliases from ~/.bashrc. Once you’ve added your new aliases, each new bash session you initiate will have your aliases setup and ready to run. The major limitation of alias is the inability to create an alias using variables to pass arguments to the aliased command. while this does restrict some possible usages, it doesn’t negate the command’s ultimate utility. Alias can be a huge relief for frequent command-line users, helping to simplify tedious commands, speed up entry, or make commands more easy to remember. Every user has their own way of setting things up, of course. What command would you consider, like alias to be indispensable in your daily usage? If you’re already making good use of alias, what are your favorite or most used aliases? * all examples are based on bash syntax, so YMMV. When dealing with multiple firewalls and you have keys set up, you can initiate all of the hops with something like this to grab a clean mysql console or anything else you need. what i was looking for was a way to run a file as root. eg. source ~/bin/file followed by "file" as root would work but i had sudo in mind.